RARE Football card, called Football Superstars, issued in 2004, very like Wizard of the Coast cards, but different backs, football in top left corner, Premier League Badge in Gold, player positions if different colours, some round edged some have corners. Not catalogued on the Football Cartophilic website. 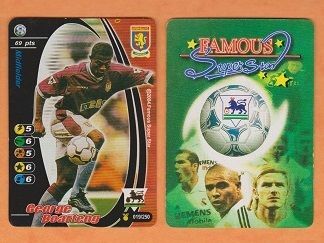 Depicting the Aston Villa and Holland star George Boateng.